To name Tom Reeves signifies the axemen who won the First World woodchopping competition, the 30 inch standing log. in 6 minutes and 22 seconds at Latrobe, Tasmania in 1891. Born at Devonport, Tasmania the son of Mr and Mrs George Reeves, he was frequently heard to speak of the wallabies and kangaroos that ere to be found where the city of Devonport is now situated. He married a Miss Helen Lethborg and they took up farming at Barrington where family descendants still farm. They had 11 children, six sons and five daughters. Tom was noted for his ability to work long hours, and being a man of exceptional strength. There were not metalled road where he first when to Barrington, and he had to cart supplies and produce over rough tracks, and was known as one of the best teamsters on the roads. Always a keen sportsman, it is not surprising to note that after attending to his farm chores, he would walk or ride to Latrobe, Devonport, Ulverstone of further afield to compete in sports carnivals. At these meetings he would often participate in a long distance run and then a couple of hours later enter the chopping ring to compete. 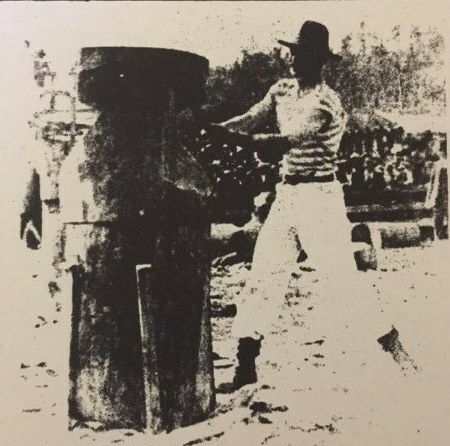 One such occasion within three or four hors, he won the Silver Championship Belt for the 6 foot girth chop, the mile and half-mile foot race all from or near scratch.